These blackberry buckwheat cream scones are nutrient rich, protein packed, slightly sweet, and bursting with blackberries. Heat oven to 425 degrees. Line a baking sheet with parchment paper or a silpat. 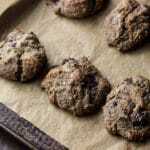 In a large bowl, combine arrowroot starch, buckwheat flour, almond flour, salt, and baking powder with a whisk. In a small bowl, add flaxseed meal and hot water. Stir together with a fork making a slurry. Set aside. In a medium bowl, whisk coconut milk, maple syrup, and vanilla extract. Add half of liquid mixture to the dry ingredients, stirring with a fork. Add the flaxseed slurry and the rest of the liquids. The dough will be more like a thick batter. Feel free to add more almond flour if it seems too thin. Carefully fold in blackberries. Using a 1/4 cup, scoop and drop batter on prepared baking sheet. With a pastry brush, brush tops of scones with extra coconut milk. Sprinkle with sucanat. Bake for 16 minutes, or until tops start to turn golden brown. Remove scones from from baking sheet and place on wire rack. Serve scones warm. Best served the day they are made, but otherwise store up to a day or two in an airtight container. Adapted and with guidance from A Baking Life and Joy the Baker.